A collection of hymn tunes celebrating the Eucharist — for choirs and assemblies. 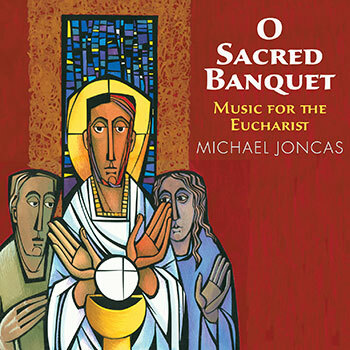 Beloved composer Father Jan Michael Joncas delivers a collection of hymns for eucharistic celebrations for a variety of ensembles. Renowned composer Father Michael Joncas delivers a collection of assembly hymns and choral anthems for eucharistic celebrations. For example, “God of Might and Mercy,” focusing on social justice, features a tune that can be sung in unison by the entire congregation. However, choirs can utilize the SATB voicing to enhance the piece, creating rich harmony. The title song, “O Sacred Banquet,” also offers two presentations: an extended concertato setting for SATB choir and organ, and a simpler unison hymn version. With a combination of the poetic sequence for Corpus Christi and a paraphrase of O Sacrum Convivium, Father Joncas has created a powerful Eucharistic hymn. For experienced choirs, “O Burning Mountain” is a contemplative, heartfelt prayer that slowly unfolds with densely voiced harmonies to depict the expansive awesomeness of God. This piece is to be sung a cappella and can serve as a contemplative hymn for post-Communion reflection. With music for both choir and assembly, O Sacred Banquet is sure to find its way into regular liturgical use. Whether reflecting on our mission in life with “Drawn by His Word,” or recounting Jesus’ appearance on the road to Emmaus with “Two Disciples on a Journey,” this eight-song collection will inspire countless faith communities.